Thanks to Melanie for hosting. Again this week was completely absorbed by other matters so not a whole lot happening on the education front. Spent all Sunday afternoon at my MILs preparing for court. 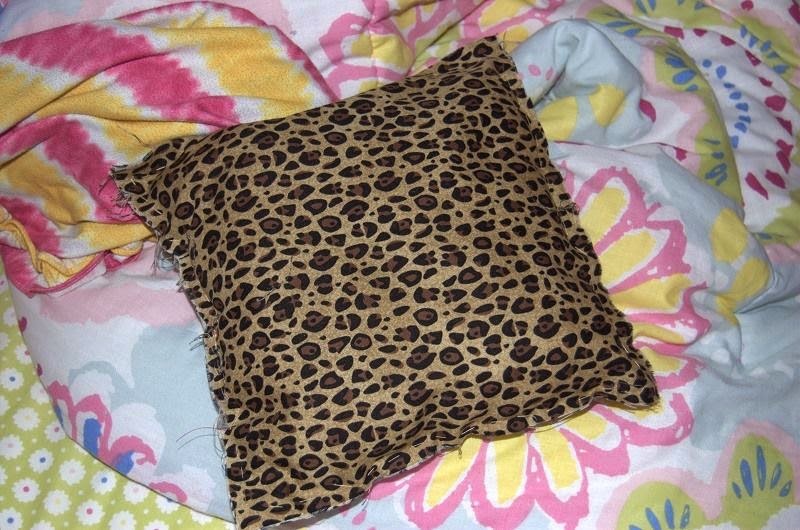 Grace got bored, raided the fabric stash, and decided to make a cheetah pillow. I'm always impressed with their little sewing projects since I excel at threading a needle and that's about it. On Monday the girls came home with their first quarter report cards. Both girls did well. Olivia's report card: reading level F, 3s in Language Arts and mostly 4s in Math. Olivia's report card is a bit of a muddle to understand. They don't give As and Bs any more and the "grades" are different than even when Grace was in early elementary. You can get a 1, 2, 3, or 4 in a variety of specific content areas. Mastery is 4 and Regular is 3 and the others are not as great. Basically if you get 3s, you are doing fine and 4 is better than expected, I guess. The reading levels are also a bit convoluted. They tell us a range for each grade level and that's about it. The Monday Night Football game was in Pittsburgh and the announcers always love to mention The Confluence. Olivia heard it and so we gave her a brief explanation of what a confluence is. She didn't seem terribly interested until I told her the big river that begins in Pittsburgh is the Ohio which is the same big river we crossed in Cincinnati on our way to Columbus. Then she nodded a knowing nod. Oh that big river! I read a few books with Sam over the week, but poor Olivia is really getting the short shrift right now. We boom and bust with her homework and her reading. There were several nights I intended to listen to her read and then we all got distracted and I forgot. Try, try again. The only real educationaly thing that happened this week is that Grace heard that a person's wingspan is the same as his height and she wanted to know if it was true. I thought a minute and said it sounded about right but how about we measure everyone and see the actual numbers. So without further ado, the data measured mostly by me and recorded mostly by Olivia in giant numbers and letters. Marian was not measured because I decided it would be too much trouble. From our little data sample, it appears that the adults are shorter than their arms and the little kids are taller than their arms. Grace, of course, is perfectly symmetrical much to her delight. I wonder if the adults have shrunk from their full height a bit, a shadow of which is left in their armspan. And maybe the little kids have yet to grow fully out of their toddler bodies. So the answer to Grace's question is that yes, armspread is a good approximation of height, but it isn't exact even if hers is. So maybe this next week, life will return more to normal and I'll have more to say.